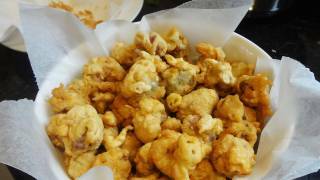 I’m happy to release the first video from my Gapshida trip, popcorn chicken gizzards! It was filmed in Wellington, New Zealand, at Jamie Frater‘s house. The cameraman is Ryan Sweeney. My blog about the trip is here. This is not an authentic Korean dish. 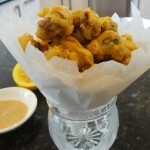 This recipe was inspired by the fried chicken gizzards served in my favorite izakaya (sake bar) in New York. When I ordered the dish for the first time, I liked it so much I thought I could develop a recipe and share it with my readers. There are 3 great things about this dish: it’s delicious, made with cheap ingredients, and easy to prepare. Now I can say mine is much more delicious and tender than the version served in my favorite sake bar, because in my version I cut it off the tough muscles. I’ve been using the dipping sauce in this recipe for a long time and everybody loves it when they taste it. You can use it for vegetables (like cucumber, carrot, or celery) or cooked meat. Serve this as an appetizer, snack, or party finger food. It will also be a good side dish for beer. I think vegetarians already have a good idea of what to do with this recipe. : ) I have met so many wise vegetarian readers during my Gapshida trip. They replace meat or seafood in my recipes with mushrooms, tofu, and other vegetables. I would use olives and sweet potato. It will make a delicious vegetarian version. Separate the gizzards into 2 pieces by cutting out the connecting muscle of each gizzard. Trim the excess fat and muscle on each piece to make a ball the size of an olive. Wash and drain in a colander. Mix 4 tbs (¼ cup) starch powder, 3 tbs flour, 1 tbs sweet rice flour, ¼ ts salt, 1 large egg, and a pinch of baking soda in a bowl. Add 7 canned whole and pitted olives to the gizzards. Mix in 1 tbs flour. Put the gizzards and olives into the batter and mix well with a spoon. Heat the vegetable oil (about 3 cups) to 350 degrees F.
*tip: Test if the oil is ready by dropping a sample chunk of chicken gizzard into the oil. If the oil bubbles, it’s the right temperature to start frying. Use 2 spoons to put the gizzards into the hot oil. One spoon to scoop out each coated gizzard ball, and another spoon to push it off the first spoon and into the oil. Deep fry over medium high heat about for 10 minutes until golden brown and crispy. Serve hot or at room temperature with the dipping sauce. Grind 1 tbs roasted sesame seeds and put into a bowl. Add 2-3 tbs mayonnaise, juice from half a freshly squeezed lemon, 1 ts soy sauce, and ½ ts-1 ts honey to your taste. Posted on Monday, December 12th, 2011 at 4:03 pm. Last updated on August 7, 2017. Posted November 17th, 2017 at 12:50 pm | Log in to reply. Posted November 20th, 2017 at 10:19 am | Log in to reply. Posted November 20th, 2017 at 10:59 am | Log in to reply. Posted February 20th, 2016 at 8:18 pm | Log in to reply. My family loved these, I did chicken hearts and chunks of lean pork I had left over from another project. The batter cooks up crunchy and delicious, I am thinking about making this tonight with chopped yard long beans fried in the same batter. The dipping sauce I made with tahini (which is what I had on hand) was great! My husband particularly loved it. I’ve found several recipes on your site, and I really enjoy your recipies. Posted December 25th, 2014 at 8:59 am | Log in to reply. Posted December 26th, 2014 at 12:59 pm | Log in to reply. I hope it was a big hit! Posted July 18th, 2014 at 8:18 am | Log in to reply. Just stumbled upon this recipe, and as a gizzard lover I can’t wait to try it. Would advise gizzard chefs to try first tenderizing the whole chicken gizzard through boiling or pressure cooking. This eliminates the need to trim away the delicious connective tissue, and the resulting gizzards are melt-in-your-mouth tender. Once the gizzards have been properly prepared, they are ready for the breading process, and your “customers” should be very pleased with the results. Posted February 6th, 2014 at 11:57 am | Log in to reply. I gotta make this batter for clams. Would it be tasty with clam, Maangchi ssi? Posted December 26th, 2014 at 1:00 pm | Log in to reply. yes, you can replace chicken gizzards with clams. Posted October 28th, 2013 at 12:42 pm | Log in to reply. Posted December 26th, 2014 at 1:05 pm | Log in to reply. Posted September 19th, 2013 at 5:59 pm | Log in to reply. Maangchi, I made this dish today and it was delicious!!! The gizzards came with some chicken hearts and it was my mistake I decided to fry those too…as the hearts pop and you get hot oil everywhere!! Good lesson learned~. The gizzards were so crispy and the dipping sauce was amazing. My husband doesn’t like the gizzards and he ate a lot of those with a beer. I didn’t have any starch at home so I added more sweet rice flour in place of starch, and the batter turned out just fine. Thanks again for this amazing recipe!!! Posted September 20th, 2013 at 1:18 pm | Log in to reply. Posted January 12th, 2012 at 9:07 am | Log in to reply. Posted January 13th, 2012 at 10:26 am | Log in to reply. oh you made this! Great! Posted January 8th, 2012 at 8:16 am | Log in to reply. Posted January 8th, 2012 at 10:41 pm | Log in to reply. I’m grad you enjoy this recipe! awesome! Posted December 17th, 2011 at 2:16 am | Log in to reply. Posted December 17th, 2011 at 11:54 am | Log in to reply. Posted January 8th, 2012 at 8:23 pm | Log in to reply. Hehe thanks Jenny :) I am definitely passionate – it was such an incredible joy to have Maangchi in my home! Posted December 14th, 2011 at 3:02 pm | Log in to reply. The video came out great! What a fun day that was – lots of hard work. I was so amazed at how you just keep working so hard Maangchi – you seem to have an endless supply of energy. Everyone loved the gizzards (and the rest of the food). I will definitely be making these regularly for parties. Posted December 15th, 2011 at 12:18 pm | Log in to reply. : ) Yes, I was so tired on that day but it was fun cooking with you. This is our video because without you, I wouldn’t have been able to film such a fun video. I’m happy to see many of my readers enjoy watching my frist Gapshida video. I thought I would be able to take a break when I come home, but it doesn’t seem to be the case. So many of Gapshida videos are waiting for me to edit along with my blog reports from the Asian countries I visited. Have a good holiday Jamie, and say hello to my Wellington friends! Posted December 12th, 2011 at 9:25 pm | Log in to reply. Posted December 14th, 2011 at 9:33 am | Log in to reply. Maha, thanks a lot for your warm words. Gapshida is done but I’m very busy editing the videos. It was a great experience cooking together with Jamie at his house. Posted December 12th, 2011 at 8:24 pm | Log in to reply. I love chicken gizzards! Looks delicious! I hope you can do Maangchi Gapshida to SHANGHAI! :) It would be so fun and I would love how to learn to cook Korean food with you! Gapshida Shanghai, sure I will keep it in mind. Posted December 12th, 2011 at 7:10 pm | Log in to reply. Wow, I must try this batter and the possibilities are endless. My hubby loves gizzard too while my kids probably prefer the more traditional chicken thigh meat. The sauce also looks irresistible. Thank you for sharing this special recipe, Maangchi. Posted December 14th, 2011 at 9:32 am | Log in to reply. oh you made this! I’m so happy to hear that all your family enjoyed your cooking! Good food makes happy family! Posted December 12th, 2011 at 5:49 pm | Log in to reply. Mere, I didn’t know you like chicken gizzards. I’m glad to hear that you’re including this dish in your next party menu. Let me know how it turns out. This recipe was originally posted on December 12, 2011 at 4:03 pm by Maangchi. It was last updated on August 7, 2017. The video was watched 282,853 times on YouTube & has 2,339 likes!